Electronics.SE has a nice WYSIWYG editor, CircuitLab. It allows a user to create an electronics schematic, which is tied in with the Imgur Image upload feature. These schematics can then be edited while editing a post, without having to start from scratch. I believe Circuit Lab would be useful on DIY.SE, considering how often wiring questions come up. Per WYSIWYG Image editors for domain-specific QA's? site specific editors are a common change for some Stacks. If the community or the mods see CircuitLab as a useful addition, can this be requested? AFAIK this would require minimal changes by the code team to enable, as it is already supported by the system. 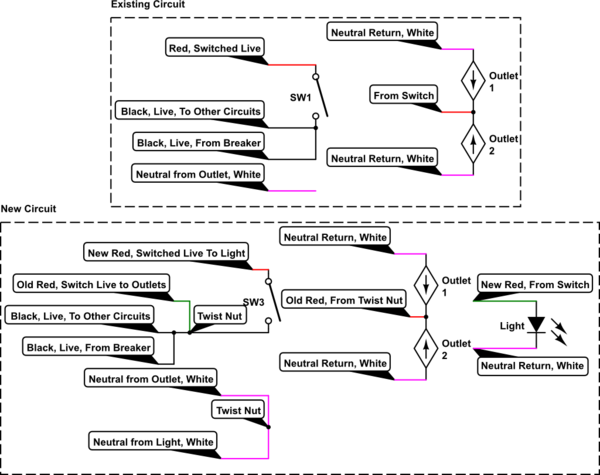 It agree that it would be great to have a tool for creating wiring diagrams, but I don't think that CircuitLab is well suited to the type of diagrams that we'd typically need on Home Improvement. CircuitLab is designed for schematic capture and simulation; it offers symbols for electronic components like resistors and transistors, with individual wires connecting them together. The symbols it provides aren't those that are typically used in home wiring diagrams. Wiring diagrams reflect how the devices are physically connected together. Again, CircuitLab is not suitable for producing diagrams like these. Having said all that, I'd love to see a similar app that could produce more conventional wiring diagrams, so I asked for recommendations in a separate post. In DC electronics you see wires going every which-way. You see it in breadboard spaghetti, in PCB traces, in schematics. We can't do that here, because whatever we do, we have to squeeze it into one of the Wiring Methods in chapter 3 of the NEC, or foreign equivalents that say the same thing for the same reasons. That means we need to use conduit or cable between A and B. Because magnetic induction and eddy-current heating is a thing in AC power, we must make currents equal in each cable or conduit. The thing we're doing also needs to be actually buildable with COTS wire or cable, not least, distinguishing wires from each other (unless we don't need to, e.g. 3-way travelers). When people bring over schematics from CircuitLab, they generally have two things that are face-plantingly incompatible with what we do. All wires are black with white background. We must work in color here, and white is one of the colors which has its own challenges. They have bubbles. That is to say, wires enclose an area. That means they are going in loops, which is prohibited due to the equal-currents rule. 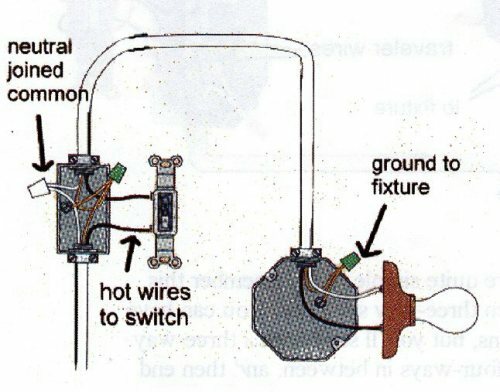 We've seen people draw ladder diagrams, completely unhelpful because they tell you absolutely no way to wire the thing. It's real easy with a ladder diagram to make something that can only be wired with 12/7 cable. Even if we are careful to adhere to the principles and make our schematic or ladder diagram buildable, we have lots of people here new to mains electrical. They're going to pick up the wrong things. Not the answer you're looking for? Browse other questions tagged discussion feature-request status-declined . 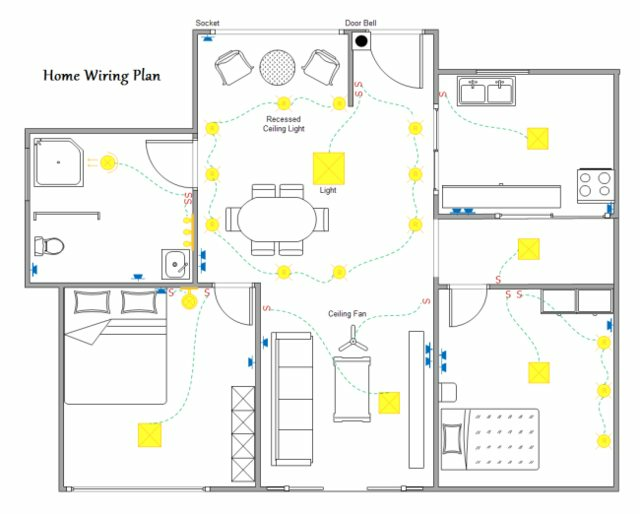 What online tools exist for creating home wiring diagrams?